This paper is an updated study on the optimal approach to fiscal equalisation and how it can be applied in Australia. The original 2017 study is posted below. This 2018 study updates the original study in three main ways. It models the two, alternative equalisation policies recommended in the Productivity Commission draft report on fiscal equalisation. These donor relief schemes are found to be inferior to the existing equalisation scheme. Either scheme would fund Western Australia to become a tax haven. Now that the Commonwealth Grants Commission has issued its equalisation assessment for 2018/19, the impacts of each alternative equalisation policy are now modelled in both 2017/18 and 2018/19. Newly-released 2016 Census data is used to show how equalisation for residence-based taxes can be limited to demographic circumstances. 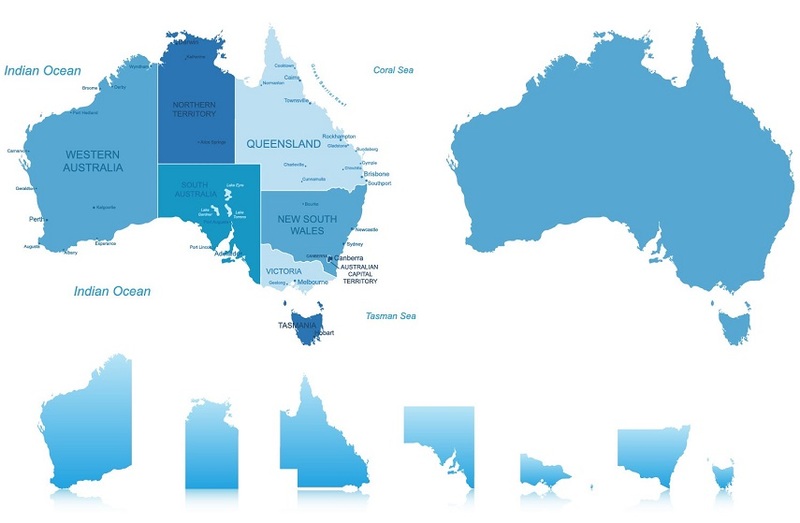 Download "Fiscal Equalisation of Australian states and territories: policy options and welfare maximisation: updated", ANU Working Papers in Trade and Development, Working Paper No. 2018/13, June 2018. The fiscal equalisation principle used by the Australian Commonwealth Grants Commission (CGC) is comprehensive by international standards in equalising the fiscal capacity of states. This system is most often justified on the grounds of equity. However, if labour is mobile then interstate migration achieves horizontal equity, while the redistribution policies of the Federal Government can achieve vertical equity. This means that the role of fiscal equalisation is to achieve an efficient distribution of different types of labour between states. A theoretical model is presented that synthesises Boadway and Flatters (1982) and Albouy (2012) and is extended to give more attention to government expenditure and to include a consumption tax. It implies that full equalisation should be applied for the fixed costs of state government and for source-based taxes on natural resources, land and capital (e.g. mining royalties, land taxes, conveyancing duty). However, equalisation should be applied in a more limited way for the variable costs of state government, residence-based taxes on labour (e.g. payroll tax) and consumption taxes (e.g. GST). Limited equalisation covers differences in fiscal capacity arising from differences between states in their demographic mixes, but not from other differences such as in productivity or amenity. Some simplifying assumptions of the model are discussed including that there are fixed supplies of factors of production at the national level, labour is fully mobile between states, state governments take their equalisation grants as given and the services they provide are private. Using the recent CGC assessment for 2017/18, the gain in consumer welfare from moving from the current Australian system to fully-efficient equalisation is estimated. Some recent proposals to move away from fiscal equalisation are also simulated and are found to involve welfare losses as they all involve moving away from full equalisation in areas where full equalisation is optimal. Download "Fiscal Equalisation of Australian states and territories: policy options and welfare maximisation", ANU Working Papers in Trade and Development, Working Paper No. 2017/12, September 2017. In the time since our 2012 report, the amount of fiscal equalisation transfers between states has increased because the fiscal advantage to WA from its endowment of mineral resources has strengthened with the mining boom. The resulting downward adjustments to WA’s share of GST revenue has led to proposals to modify the HFE system. design and model a fully-efficient or welfare-maximising HFE system. Abolishing the current HFE system and moving to a modified equal per capita (EPC) system is estimated to lead to a permanent loss in annual living standards of $521 million in 2015/16 terms. This estimate is consistent with our 2012 report estimate of $295 million, once two developments are taken into account. First, the previous cost estimate was on a 2009/10 basis whereas the new estimate is on a 2015/16 basis, and nominal incomes have risen substantially over that period. Second, equalisation has become more significant because the mining boom has added to equalisation transfers. Moving away from fiscal equalisation by switching to a grants-based system is estimated to result in an annual loss in living standards of $210 million. Similarly, introducing a floor on GST relativities of 75 cents in the dollar results in an annual loss of $120 million. In both cases the losses arise mainly from watering down equalisation for the different capacities of states to raise revenue from mining royalties. Fine tuning the existing HFE system to make it optimal is estimated to result in an annual gain in living standards of $14 million. Under an optimal HFE system, there would be no equalisation for differences between states in labour market outcomes for the same demographic group. Download "Horizontal Fiscal Equalisation: Modelling Update and scenarios". Since the seminal article by Buchanan in 1950, it has been generally accepted that equalising transfers between states can help to overcome concerns associated with different state fiscal capacities. In Australia, state fiscal capacities are equalised through the Horizontal Fiscal Equalisation (HFE) system used in distributing GST revenue between the states. The South Australian Department of Treasury and Finance (SADTF) engaged Independent Economics to undertake economic modelling of the welfare and efficiency impact of Australia’s HFE system. This was in the context of the Australian Government Review of the Distribution of GST Revenues, which was announced in March 2011. Independent modelled the effects of moving away from the existing HFE system to a system under which GST revenue is distributed between the States and Territories on an Equal Per Capita (EPC) basis. However, this EPC system was modified to maintain the existing equalisation for indigineity. The main finding of the modelling was that such a move away from the existing HFE system to a modified EPC system would result in a permanent loss in annual living standards of $295 million (on a 2009/10 basis). This loss occurs because a move away from equalisation sets in train economically inefficient interstate migration that is based on state fiscal advantage, notably from royalties received from mineral deposits, rather than economic opportunity. Because the free movement of population between states works to close inter-state gaps in living standards, the $295 million loss would be shared across all states. The only apparent benefit to offset against this nationwide loss from moving away from HFE would be a saving in the costs of administering the HFE system. However, the annual cost of running the Commonwealth Grants Commission is only $7 million. Download "Horizontal Fiscal Equalisation: Modelling the welfare and efficiency effects".